One of the best parts of Christmas is after the rush of shopping for gifts is finally over you can sit down and take the time to carefully wrap up those special presents. Instead of just buying Christmas wrapping paper this year why not be a bit more creative and set about making your own uniquely designed gift wrap? You could even start with something as simple and basic as plain brown paper but with your own added trimmings. Visit an arts and crafts shop and pick up your choice of coloured tape, paint, stickers, stamps, fabric etc. It's the thought that counts and people will appreciate a little extra effort in the wrapping. Pick colourful lengths of ribbon in different shades and tie in some cinnamon sticks or holly berries. Plain paper such as brown paper makes it easy to add your own design over it. Place a pattern or shape cut out of paper or card over the plain gift wrap. Then use a coloured spray paint such as silver gold to spray over the area making sure that the plain paper is well coated. Remove the top layer of paper with the pattern cut out of it and voila! You have your own uniquely designed wrapping paper! Tying up your presents with lengths of lace is an easy and pretty way of adding a chic vintage look to your gift wrap. Couple this with a subtly patterned paper, red will work particularly well with cream lace. Choose a nice thick lace ribbon and add in a thin coloured satin one for an even more luxurious look. At Strawbridge we have a variety of ribbons in different fabrics and colours in our showrooms. Click here to find directions to us in the Shopping Courtyard, Mount Usher Gardens, Ashford, Co. Wicklow. 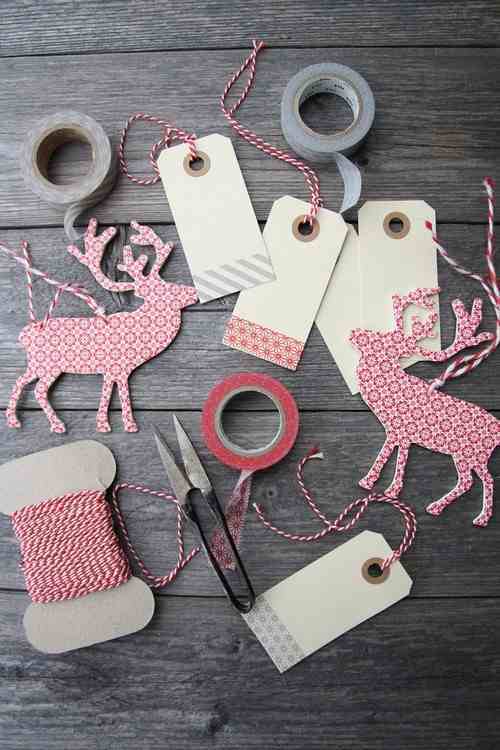 If you are keeping your wrapping plain then get creative with your present tags. Buy patterned sheets of card and either trace or draw out a design on the plain side of the card. If you want to make it easier for yourself then pick one design for all tags, draw and cut it out and then use it as your template for the others and trace around it to create more. Once the tags are cut simply punch a hole in them and tie in some pretty ribbon or string and add your message on the plain side. Be sure to cut out your design just inside the line so nobody will see you pen or pencil marks. Use a craft knife blade rather than a scissors for precision. A great DIY idea is to use paper doilies as part of your wrapping! Choose a plain wrapping paper for the first layer in any colour and then use double sided tape to attach the doilies over it. You could print the person's name in the centre of the doilie or a Christmas message. 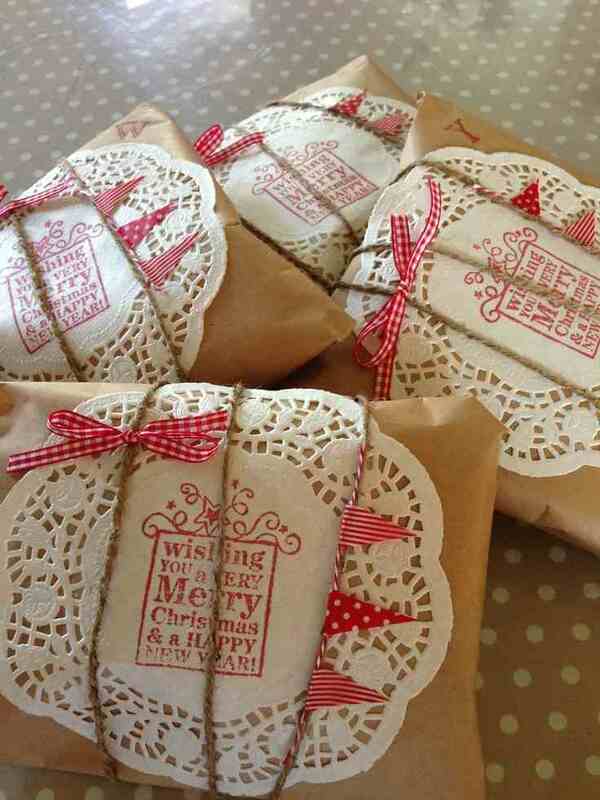 To complete the effect tie patterned ribbon and twine around the middle of the package. If you are feeling particularly creative you could make miniature bunting out of sheets of patterned paper and attach them in with the twine for a festive feel! A really pretty idea is to pin a beautiful brooch into the centre of the bow on your gifts. Vintage brooches can be picked up at many market stalls and antique shops. This would make any lady's day! You could do this with a small Christmas decoration either, giving the person two gifts in one! Don't forget to follow us on Pinterest for more inspiration!